Bill Roache led tributes to Coronation Street's Anne Kirkbride at tonight's National Television Awards. As the soap's Ken and Deirdre Barlow, they shared the screen for more than 40 years. Coronation Street has paid a quiet tribute to star Anne Kirkbride showing a picture of the actress, who plated Deirdre Barlow for 40 years, at the end of tonight's programme. Anne Kirkbride died on Monday after a short illness. 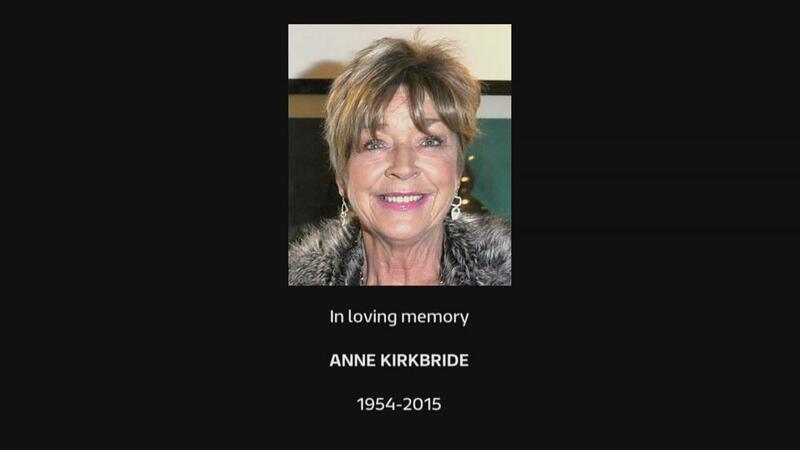 Her onscreen husband gave a touching tribute to actress Anne Kirkbride who died earlier this week. TV favourites Ant and Dec spoke of their shock at the sudden passing of Coronation Street legend Anne Kirkbride at the National Television Awards (NTAs) on Wednesday night. Ant told ITV News that the news of her death was a "very sad" while Dec said Anne would be "in everyone's thoughts". The Geordie pair, whose TV credits include Britain's Got Talent and Saturday night takeaway, once again won the gong for presenting. Former Coronation Street star Natalie Gumede, who played Kirsty Soames from 2011- 2013, has paid tribute to Anne Kirkbride at the National Television Awards (NTAs). Natalie told ITV News: "I think it's going to be a very poignant evening, it's a great celebration tonight but obviously it's tinged with a great deal of shock that we're all feeling, as a nation I think." Coronation Street star Helen Worth tearfully told Good Morning Britain how much Anne Kirkbride will be missed on the set. The ITV soap shut down filming yesterday but Worth - who plays the long-suffering Gail McIntyre - said she was happy to be back on the cobbles so she could reminisce about Kirkbride with others who knew her so well. "I personally am grateful to be back on set today amongst the cast where we can talk about Annie and remember the wonderful lovable person that she was," the actress told GMB. There are calls for Coronation Street actress Anne Kirkbride to be given a posthumous lifetime achievement award following her death on Monday. It was revealed her onscreen husband William Roache, who played Ken Barlow, will deliver a touching tribute to her at the National Television Awards tonight. And the soap is bookies' favourite to scoop the award for best serial drama. Anne's castmates are due back at work today after hearing the heartbreaking news. Writers now face the task of writing the much-loved character out of the show and say it will happen within the next month. Coronation Street star William Roache will lead the tributes to Anne Kirkbride as the world of broadcasting honours the late actress at the National Television Awards. He is due to take the stage to speak about her contribution to the show and share his memories of his on-screen wife. As the soap's Ken and Deirdre Barlow, they shared the screen for more than 40 years and remained friends despite the demise of their screen marriage. Coronation Street was already likely to have a strong presence at the ceremony as the show is up for the best serial drama prize. Although Coronation Street actress Anne Kirkbride was best known for her role as Deirdre, she was 17 when she landed her first profesional acting part. ITV Granada correspondent Amy Welch takes a look back at Anne's career and how it all started in her home town of Oldham. For 44 years, Anne Kirkbride portrayed the turbulent life and times of Deirdre Barlow in Coronation Street. William Roache - her on-screen husband Ken Barlow - spoke movingly to ITV News reporter Damon Green, of a friend and colleague who was "always loving, always happy".